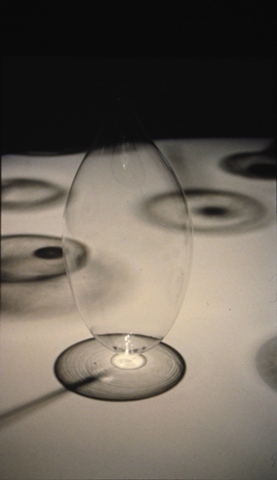 My work represents a series of discoveries made while working with the properties of glass and light. Some of the properties of glass are its hot fluid qualities, its refractive qualities, its magnification and reductive properties. I think of my studio as a laboratory where curiosity and imagination lead to experimentation and discovery. Eventually, this yields glass forms that reflect the elemental and physical properties of glass that have always inspired me. Glass speaks clearly about light. It seems so simple yet its ability to assume an infinite number of forms and to evoke just as many feelings, render it complex. Creating shapes that exude a quiet beauty, simplicity and sensuality represents the most basic foundation of my work; the juxtaposition of those shapes reveals relationships that are, in turn, basic to a more complex whole. In the end, my greatest hope is that those who see my work walk away with a sense of wonder, mystery and the same inquisitiveness that I experienced in its creation.